2015 Nissan Murano Pros and Cons: Why (Not) This Car? The 1990s were the decade of the SUV. But towards the end of this decade, auto makers realized that, while people liked the seating height of SUVs, they weren't so crazy about how they rode and handled. So, led by Toyota and Honda, they started offering vehicles with the ride height of SUVs, but with the underpinnings of cars. The Camry-based 1999 Lexus RX was the first to hit the sweet spot. For 2003, Nissan aimed for a similar target with the Altima-based Murano crossover, and scored a hit. In those early years of the crossover no one was sure how they should look. Should they appear trucky and rugged, or sleek and sporty? Should they have the relatively long, low proportions of station wagons, or the more upright proportions of SUVs? With the 2003 Murano, Nissan bet on a combination of upright proportions and sleek, sporty styling. This turned out to be a very good answer. Noting the Murano's success, Ford developed the Fusion-based 2007 Edge. The Edge, with little edge to it, didn't excite car reviewers, but it sold even better than the Murano (and far, far better than the wagon-like Ford Freestyle). The Edge's advantages over the original Murano included a price about three grand lower and a more compliant suspension. Nissan was all about performance and sporty handling back in the mid-2000s, and the first-generation Murano could be a bone shaker. Nissan smoothed quite a few edges off the Murano with a 2009 redesign. Ford refreshed the Edge in 2011, with changes that included the first implementation of the controversial MyFord Touch infotainment interface. For 2015, both have been completely redesigned. Which best hits the sweet spot now? Why the 2015 Nissan Murano? With pretty much everyone now offering crossovers, it's not easy to stand out from the crowd. Nissan's solution: styling that cannot be missed. The Murano has always been a stylish vehicle, but each redesign has added curves to the originally spare curves. With the 2015, there's a whole lot going on from every angle. You won't find this much drama in any other crossover's sheetmetal, plus a rear pillar blacked out to create the impression of a floating roof. If that's not enough, the Murano's signature color remains a copper metallic. Too much for your taste? The new Ford Edge's styling is more restrained, perhaps to a fault. It's magnitudes more likely than the Nissan to blend in. Other recent Fords have been quite stylish. With the new Edge, Ford appears to have made the same conservative shift that hasn't done Hyundai Sonata sales any favors. Now that I mention Hyundai, the new Edge's large hexagonal grille strongly resembles that on the Santa Fe Sport. The mid-level SEL, as tested, wears 18-inch wheels. Eighteens have rarely looked so small. The Edge looks much better with the Titanium and Sport trims' larger wheels. My initial impression of the 2015 Murano was "overdone." But it was far more exciting to photograph than the 2015 Edge. 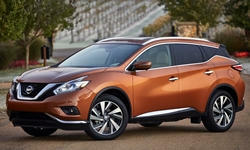 Nissan didn't benchmark the Edge for the new Murano. Instead, it's gunning for the Lexus RX. If you're going to steal sales from Lexus, your vehicle better have a nice interior. The new Murano does not disappoint. As with the exterior, curves dominate, but here they flow smoothly together to cultivate a relaxing atmosphere. Contrasting stitching decorates not only the seats but also padded surfaces on armrests, the sides of the center console (too often hard plastic), and the instrument hood. You won't find any wood, real or otherwise. Instead, trim with the appearance of brushed metal adds visual interest while appearing thoroughly modern. Ford also has dramatically upgraded its interiors in recent years, but inside the new Edge they don't appear to have stretched as far. The center console and door trim, which includes much unadorned matte black plastic, don't look or feel as upscale as the Nissan's, perhaps to leave more room for the related 2016 Lincoln MKX. The interior styling is handsome, but it's decidedly more conservative and less artful than the Murano's. Are they sandbagging, to leave more room for the related 2016 Lincoln MKX? Perhaps. Nissan's luxury division, Infiniti, doesn't offer a counterpart to the Murano, so it's free to pursue Lexus. To be fair to the Ford, I did test the mid-level SEL trim. But I was able to examine the top-level Titanium in the dealer's showroom. While considerably nicer than the SEL owing to softer leather on more luxuriously contoured seats, the other materials and the overall design are the same as in the SEL. Not a fan of the black interiors in the tested cars? Both offer two other upholstery options, one light and the other dark brown. I nearly ranked the new Nissan Murano's front seats ahead of its styling as reasons to buy one. With form-fitting contours and cushy-yet-supportive construction "inspired by NASA," they're that good. I wasn't able to drive the Murano all day, but felt like I easily could have. The 2015 Ford Edge's driver seat didn't initially strike me as especially comfortable. It felt flatter and less luxurious than that in the Nissan. But over the course of my test drive it seemed to fit and support me better and better. By the end it seemed very comfortable, yet still not quite as good as the Nissan's. The Edge Titanium's seats have a sportier appearance and shape than the SEL's, and might provide more lateral support. As mentioned in the introduction, the original 2003 Murano could batter occupants. Though not based on a truck, it rode like one. By the time Nissan developed the second-generation 2009 Murano, it had gotten the message that the great majority of car buyers cared more about ride quality than sporty handling, and the entire company's focus had shifted. The redesigned crossover rode much better. The 2015 Murano, among the most car-like crossovers, seems to ride even better (though my route didn't include any badly broken pavement). Noise levels are low, with just a little tire roar on coarse road surfaces. This befits a car that aims to compete with a Lexus. The new Ford Edge rides well, but with somewhat firmer tuning than the Murano. Bumps don't upset the Edge's composure like they do that of some crossovers, but you'll feel and hear them a little more than in the Murano. Noise levels are also higher than in the Nissan. This was perhaps the biggest surprise, as other recent Fords have been among the quietest cars in their segments. As with the interior materials, I wonder if Ford held back a bit to leave more room for the related Lincoln. Within today's Nissan, fuel economy seems a far higher priority than performance. The Murano's base engine remains a naturally aspirated, port-injected 3.5-liter V6 good for 265 horsepower. In some applications Nissan's V6 can be thirsty. But in the Murano it's somehow efficient. Much credit is likely due the CVT (continuously variable transmission). Together the pair achieves EPA ratings of 21 mpg city, 28 mpg highway with either drive train--very good for a crossover of this size and power. Ford also offers a naturally-aspirated, port-injected 3.5-liter V6, but rated for 280 horsepower. Paired with a six-speed automatic it manages only 18/26 with front-wheel drive (FWD) and 17/25 with all-wheel drive (AWD)--well short of the Nissan's figures. A new performance engine, a 315-horsepower turbocharged, direct-injected 2.7-liter V6, earns ratings similar to the 3.5's. The new base engine, a 245-horsepower turbocharged, direct-injected, 2.0-liter four-cylinder, does about as well as the Nissan's V6, 20/30 with FWD and 20/28 with AWD. But a four never sounds or feels as a good as a V6, even if it is as strong. If we compare apples to apples, the Nissan scores a clear win on fuel economy. I wasn't able to drive either car on my regular route, so I cannot comment yet on real-world fuel economy. My experiences in other Nissans and Fords suggest that the Nissan's advantage will be larger in typical driving. Why Not the 2015 Nissan Murano? The 2015 Nissan's Murano's flowing sheetmetal might be exciting, but it's not entirely practical. Normally I like a low, car-like driving position. But combine such a position with an upwardly bulging hood and a deep instrument panel, and you'll feel like you're viewing the road ahead through a tunnel. Wide pillars limit rearward visibility. This isn't the sort of driving position and outward visibility that initially made SUVs and then crossovers so popular. The new Ford Edge's instrument panel is as excessively deep as the Murano's, but you sit higher above it, so the view forward is much more open (if still not best-in-class). The new 2015 Nissan Murano handles with commendable stability, safely and predictably. But unlike the original Murano, it doesn't feel sporty in the slightest. Much of the blame is due light, somewhat numb steering. If the exciting styling leads you to expect an exciting driving experience, you'll be disappointed. But Nissan's market research must suggest that few people are seeking exciting handling from such a vehicle, or it wouldn't have dropped this attribute from the menu. As has been its recent tendency, Ford tuned the Edge SEL's suspension tuning for a firmer feel and sharper responses. When hustled along a curvy road the new crossover's moves border on athletic. Electronics lend a hand; a torque-vectoring system selectively applies the brakes to counteract the inherent tendency of the chassis to understeer (plow toward the outside of the curve). But the Ford's steering is also on the light side, and in fairly casual driving the basic Edge feels barely sportier than the Murano, so still not much at all. Based on my experience in other recent Fords, I expected better. This said, unlike the Murano the Edge is offered in Sport form. Also, options on the Titanium and Sport include an active steering system that varies its ratio depending on the situation. Especially with this option the new Edge Sport could live up to its name. I'll have to test one to find out (stay tuned). Of course, if you have no interest in sporty handling, then this reason not to buy the Murano goes away. When some people hear that the Nissan Murano has a CVT (continuously variable transmission), they immediately cross it off their list. CVTs have a reputation for feeling like a badly slipping conventional transmission. Engines paired with them just don't sound or feel right. But Nissan (like Subaru and some others) has addressed this by programming its latest CVTs to mimic the stepped behavior of a conventional transmission. Instead of placing the engine at the rpm optimal for the situation and holding it there, they place the engine close, then gradually increase rpm for a while, then drop it back, repeat. Engine speed still varies much less than with a conventional transmission, benefiting fuel economy, but it now varies with vehicle speed enough to avoid an odd slipping sensation. CVTs have always had the benefit of smooth shifts. Pair one with Nissan's smooth 265-horsepower V6, and you've got exceptionally smooth, almost effortless (if short of exciting) acceleration. I tested the new Edge with its base engine, a 245-horsepower turbocharged four-cylinder. Funny thing--a similar engine was a $995 option last year. Conversely, this year an engine similar to last year's standard V6 is a $425 option. One gets the feeling that these prices aren't related to manufacturing costs. But I digress. The turbo four performs nearly as well as a V6 in typical daily driving, but doesn't sound or feel as smooth. Also, perhaps because it's tuned for fuel economy, the turbo four doesn't initially feel responsive. Take a deep stab at the gas pedal and the new Edge scoots fairly well, but the throttle calibration doesn't encourage this. Then again, there's that Sport model, with its own 315-horsepower turbocharged V6. If you're looking for performance in an Edge, that will be the one to get. Nissan doesn't offer anything to match it. If I'd tested the Edge Sport, the comparative powertrain performance rating would very likely differ from the one you see above. The second row in either vehicle has plenty of room for two adults, and decent room for three. The Ford's seat has an edge, as it is mounted higher off the floor, for better thigh support. Also, with a couple inches more shoulder room, it should better accomodate a third passenger. Both the Murano and the Edge have cargo areas typical of midsize two-row crossovers. The Ford's specs suggest it'll hold a bit more, but Ford has been cheating its specs lately. Figure they're about the same, with cargo floors about three feet long with the second row up and about six feet long with it folded. Except in base trim the Edge has a power release for the second row in the cargo area. Why not just a mechanical lever? Beats me. The Murano in Platinum trim goes even farther down this mechanized path, with a seat that can be powered back up as well as down. A neat trick, I suppose. But if you want the seat up it's probably to put people in it, and they'll open the side doors to get in anyway. There's no clear benefit to being able to put the second row back up when standing behind the vehicle (unless I'm missing something). From the start the Ford Edge was significantly less expensive than the Murano. Though the 2015 creeps up a bit, when equipped similarly to the Nissan Murano it remains about $1,500 less. Not a big difference, but a difference. The Ford starts at $28,995, the Nissan at $30,445. All-wheel-drive adds about $1,600 in either case, and other popular options boost the prices into the upper 30s. Load a Ford Edge Titanium V6 AWD up like the tested Murano Platinum, and it costs more, $45,910 to $43,955, but includes about $3,000 in additional content. But is this additional content worth $3,000 more, or even $2,000 more, to you? It depends, check the list. And the Edge Sport? It costs about $2,200 more than the Edge Titanium V6. Unless you upsize the latter's wheels to the 20s standard on the Sport. Then the difference shrinks to about $1,200, a reasonable bump assuming that the Edge Sport delivers the performance promised by its name and specs. The new 2015 Nissan Murano looks exciting and drives comfortably. If you've been seeking this combination in a midsize, relatively affordable (if still far from inexpensive) crossover, it's likely the one to get. Styling and front seat comfort are big strengths, while ride quality and fuel economy are also quite good. The only likely deal killer (for those not seeking a thrilling driving experience): the view forward from the driver seat over the deep instrument panel and bulging hood is a bit much like that through a tunnel. In SEL trim, the new 2015 Ford Edge doesn't distinguish itself nearly as much as the new Murano in any particular way. It's a thoroughly competent vehicle, with a more comfortable rear seat and marginally better handling than the Murano. But it's no edgier than the original--there's nothing interesting or exciting here. Overly light, incommunicative steering, also an issue with the Nissan, keeps the well-tuned chassis from delivering joy. The Edge Sport could prove worthy of its name, but that must await a future test. As tested, both crossovers deliver what the typical buyer is looking for, but the slightly more expensive Nissan has much more distinctive styling and a more upscale interior. Nissan provided vehicles to drive and breakfast at an event for invited media. Frank Cianciolo of Avis Ford in Southfield, MI, helpfully provided an Edge for a test drive. He can be reached at 248-226-2555. 2015 Nissan Murano pros and cons, according to Michael Karesh: the best reasons for buying (or not buying) the 2015 Nissan Murano. Join TrueDelta to post your own impressions. Yes, Michael, I have a few throughts. I read this earlier today and wanted to post these. The real bothersome points I have with the new Murano is the veiws, just like you. However, I think these count a great more than you do in the negative column. How can any car that was initially loved and purchased BECAUSE of the better site now get away with a bad design? The ever dissapearing rear is one thing, but now they are taking away the front? THis bothes me a bit in the Escape as well. The front A pillars makethe viewfeel narrow out the front, almost like a pinching at the bottom of the windshield.There are times I pine for the view in the Forester so much...but its poor inside materials and MPG had me chose the Escape. The front as well now in the new Murano??? Say it aint so!!! Sorry, but this is a bigger issue than MPG or comfort. In fact, next to lack of cargo space, the vision thing really is big for me. Well, a hell of a lot more than its ability to enjoy its photo shoot. I for on am really looking forward to testing the new 2.7 sport Edge as well as whatever the Lincoln comes with. The view forward in the new Murano is quite a bit worse than that in the Escape, though I dislike the upturned corners at the bottom of the Ford's windshield as much as you do. I've asked Ford for an Edge Sport to test. Hopefully soon. On the CVT in the Murano, many owners of the Pathfinder and Altima have complained about shuddering, but not outright failures. We've had more reports of failures with the CVT paired with four-cylinder engines in smaller Nissans. In either case, the major concern is what happens out of warranty. People who buy new cars don't have to worry about this (unless it impacts the trade-in value). The 2015 Murano is a huge styling leap from the old model. Nissan has definitely succeeded in its effort to have their vehicle stand out in a crowded field of mid-sized SUVs. The low lounge seating position combines with the high hood and rear window to yield such poor visiblilty that Nissan has found it necessary to provide an overhead camera system so you know where the corners are. Nissan is also experimenting with a video screen to replace the rear view mirror. Forward collision mitigation, variable cruise control, lane departure warning, blind spot system, backup camera... who needs windows!